I have gotten into the habit of having scones or muffins in the freezer of late. This is for my son Adam who is not a breakfast person, I am hoping to entice him into eating something in the morning. So far I think that this has been working out quite well. When I find the empty container on the counter I know that it is time to bake another batch. This batch that I made this past weekend of course had to be made with some fall fruit. I had apples left over from the apple torte that I posted about a few posts back and decided it would be a great way to use some of those apples up. I paired apple, walnuts, oats, and let’s not forget the cinnamon. I made these scones into a drop scone, I find that these are a little less time consuming and I like the shape of them. 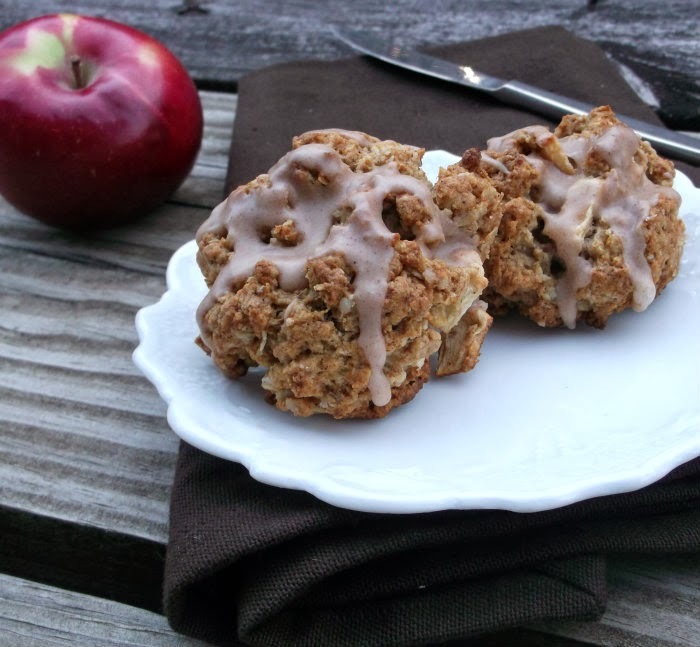 Last I drizzled a little cinnamon icing over the scones for a bit more sweetness and a bit more cinnamon flavor. Let’s just say I think that I will find that container empty before I know it. 2. Whisk together flour, oats, walnuts, sugars, cinnamon, baking powder, baking soda, and salt. 3. Cut in butter with a pastry blender or rub with your fingers (the largest pieces should be the size of peas). 4. Whisk together the cream and the egg together. Add the cream mixture and the chopped apples to the flour and oats mixture, stirring until dough comes together. 5. Grease or line baking sheets with parchment. Using a tablespoon scoop heaping spoonful of dough and place them on prepared baking sheets. Bake until lightly browned about 12 to 15 minutes (it will depend on large your scones are). 6. Place on cooling rack and cool completely. 7. While the scones are baking place the ingredients for the icing in a small bowl and beat together until smooth and the right consistency for drizzling. 8. Once the scones are cooled completely drizzle with icing. The.Boy loves eating sweets for breakfast as well, so maybe I should start keeping more scones on hand! Sounds like a great fall flavor! 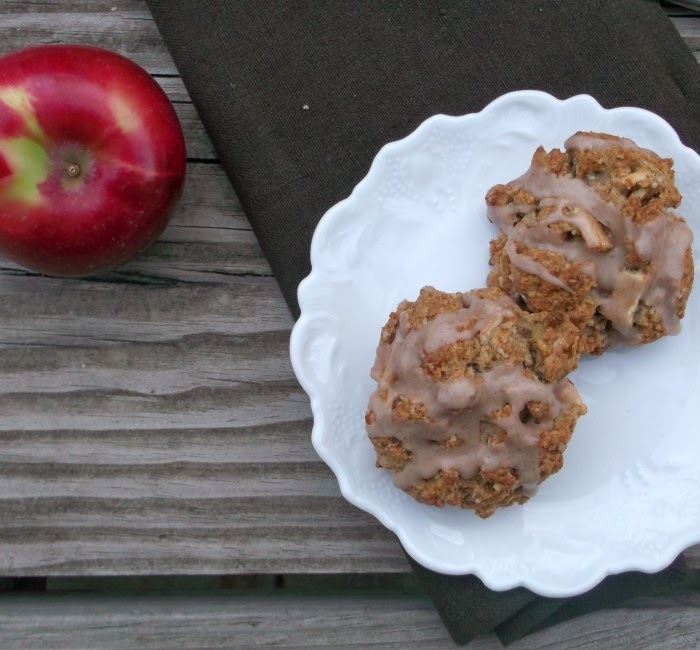 These scones literally look like fall. I bet they smell delicious while they’re baking. These look terrific! 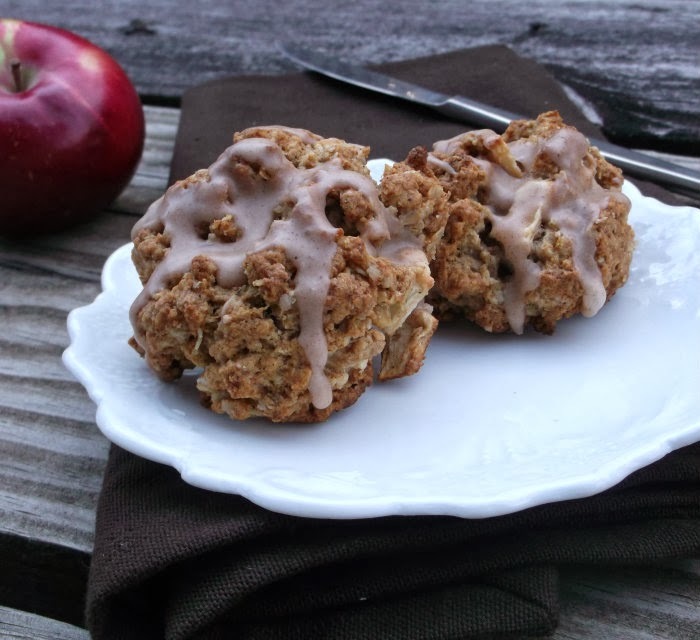 Anything with cinnamon gets my attention, but the combo of ingredients in these really is inspired. Thank! I wish I had one of these with my coffee right now. They look wonderful.